Epson Stylus TX100 and TX105 is a multifunction printer designed to deliver high quality results for all your printing, photocopying and scanning. This epson printer can print up to 5760 dpi with Variable-Sized Droplet Technology and it having print speed 26 ppm for black text and 14 ppm for color text on A4 paper size. Run the software (Adjustment TX100 and TX105 no instalation require). Then click accept button. Click select button to seledt your printers type. Available two coiche. Epson TX100 or Epson TX105, Ok. Click paticular adjustment mode. 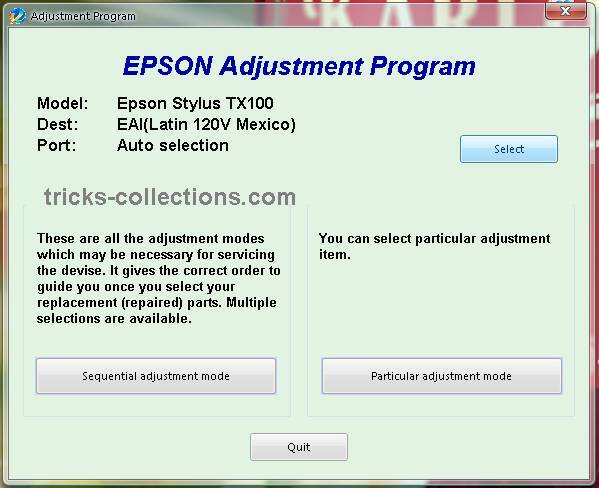 Click waste ink pad counter from maintenance menu, OK.
Click check to view status counter of your printers. Click initialization to reset the counter. To reset the Ink Pad Counter, download the Ink Pad Reset Software from our website. We offer instant download software solutions to a range of Epson printer issues relating to waste ink pads.